Searching for The Peninsula’s Knysna Warblers – August 2013. The Knysna Warbler can be considered as a classic Little Brown Job or “LBJ”. They are fairly small, mostly brown, skulking birds which are rarely seen. See figure 1. However, they have a distinctive and loud call which betrays their presence, especially in early spring. 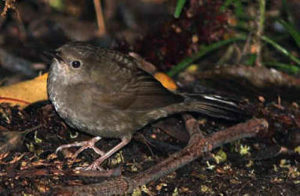 The Knysna Warbler is endemic to South Africa and is classified as Vulnerable. In Cape Town the population of Knysna Warblers occur on the lower eastern slopes of the Table Mountain chain occurring roughly from Tokai to Newlands. They occur mainly in thicket vegetation along the Greenbelts. It has long been recognised that the Knysna Warbler is in a state of decline on the Peninsula. A fair deal of work was done on the subject by the late Prof Phil Hockey and Brent Visser whose research indicated that the main causal factor for the decline of the Knysna Warbler locally, was a change in habitat structure due to a change in the fire regime in their habitat. Basically, the thicket vegetation which they need is slowly changing into forest with insufficient understory. The result is that the birds are making greater use of the greenbelts and large gardens which still have dense tangles and thickets. There may however be other causal factors which are contributing to the decline of the species locally. The Cape Bird Club Conservation Committee is keen to work in collaboration with the City of Cape Town to see what can be done to prevent the very likely possibility that the Knysna Warbler could become locally extinct in the City of Cape Town. Click on the link for the audio call of the Knysna Warbler, supplied by Simply Birding. An important component of managing the Knysna Warblers on the Peninsula is to know where they currently still occur and how many are left. This important baseline data will be invaluable in deciding on any management interventions in time. A critical management intervention is to annually assess the number of remaining birds so that we can monitor the population. Cape Bird Club Conservation Committee. Should Pied Crows Corvus albus numbers be controlled? Numerous complaints and queries are frequently raised with regards to the ecological impacts of Pied Crows. While this species is indigenous to the Western Cape, its numbers have increased greatly due to human activities. This includes the creation of artificial roosts at nesting sites and an increase in food availability through road kills, rubbish tips and farming. There is a lot of anecdotal information that suggests that Pied Crows are having a direct negative impact on wildlife, at least at a local level. However, the culling of an indigenous species can only be advocated if there is scientific evidence quantifying the problem and proposing methods, which could be used if culling was deemed to be viable and necessary. Without this scientific information, any control program is likely to fail. 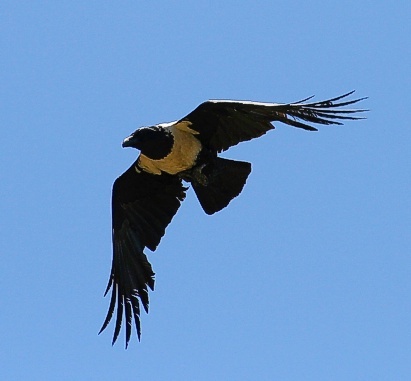 A localised control programme would in all likelihood create a vacant territory area and crows from the surrounding areas will just move in to replace the culled individuals. As such, sound research into the situation needs to be conducted before any management interventions can be implemented. Should House Crows Corvus splendens be controlled? The House Crow is an alien species, which has become established, in many urban centres around the world. Unlike the Pied Crow, the House Crow is an alien species, which has been accidentally introduced by man. In South Africa the species has become established in Cape Town and Durban. Being highly intelligent and opportunistic, House Crows will utilise any good food source available to them. They are also reputable nest raiders and can devastate local bird populations. 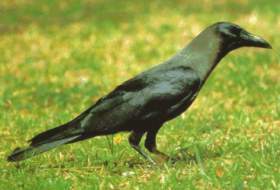 In east Africa, House Crows have been attributed with the huge reduction is local bird species diversity in urban centres. They are also known to carry human diseases such as Cholera. While the population is still at levels where complete eradication is possible, it is felt that the authorities should be encouraged to eradicate this species in a humane manner. The City of Cape Town is running a very successful programme to control this species through the Invasive Species Unit (ISU). The Cape Bird Club Conservation Committee is supportive of this programme. Should Egyptian Geese Alopachen aegyptiaca be controlled? 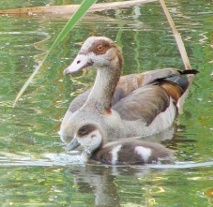 The Egyptian Goose is locally indigenous to the Western Cape, which means they have always occurred in the Cape Town area. Their numbers have dramatically increased in recent years due to favourable conditions created by development (such as golf courses, large lawned areas) and man-induced habitat alteration and the absence of natural predators in some urban areas. Supplementary feeding by humans can also greatly increase the densities of these birds at a given locality. The Egyptian Goose is not an invasive alien species and there is no eradication programme in place to control their numbers. Although perceived as a nuisance by some, the culling of an indigenous species cannot be advocated in the absence of scientific evidence quantifying the problem and proposing the methods which could be used to address the problem should it be necessary and viable. Disturbing and flushing the birds should they make unwanted use of your pool, pond or lawn. Replace extensive lawn areas with locally indigenous planting. Low-growing indigenous sedges, grass and groundcovers could also function as substitute lawn areas. Less lawn would make your property less attractive to Egyptian Geese. Let the grass grow slightly longer between mowing – the Egyptian Geese prefer nice short grass and would be less keen on longer lawns. Create a ‘screen’ between your water edge / pool and the lawn area. This can effectively be done by planting a row of restio’s along the edge of paving between the pool and the grass. Feeding waterfowl and other birds such as guinea fowl is a popular activity for some people. Tossing food like bread, table scraps, corn or popcorn attracts ducks, geese and other birds to places like dams, parks and ponds. Feeding these birds is a popular pastime and a relaxing activity bringing people closer to nature, or a fun activity for children wanting to interact with wildlife. However, feeding the city’s waterfowl and guinea fowl can lead to a number of problems and even be harmful to the birds themselves.